This is the best recipe for Oatmeal Cookies on the planet. This recipe is the perfect choice for filling up a cookie jar. Your family will love these cookies; guaranteed. The last time I made them I added a cup of toffee bits that melted into the cookies. You could also add any type of chopped nuts; some cashews would be delicious, especially if you use the salted variety. Yum. Don't fiddle with this recipe, except to add some ingredients such as the toffee bits, or chocolate chips. The proportions of ingredients in this recipe are fine tuned. If you use too much corn syrup, for instance, or not enough milk, the cookies will not turn out. And be sure that you are measuring the ingredients correctly. Use quick cooking oats in this recipe. 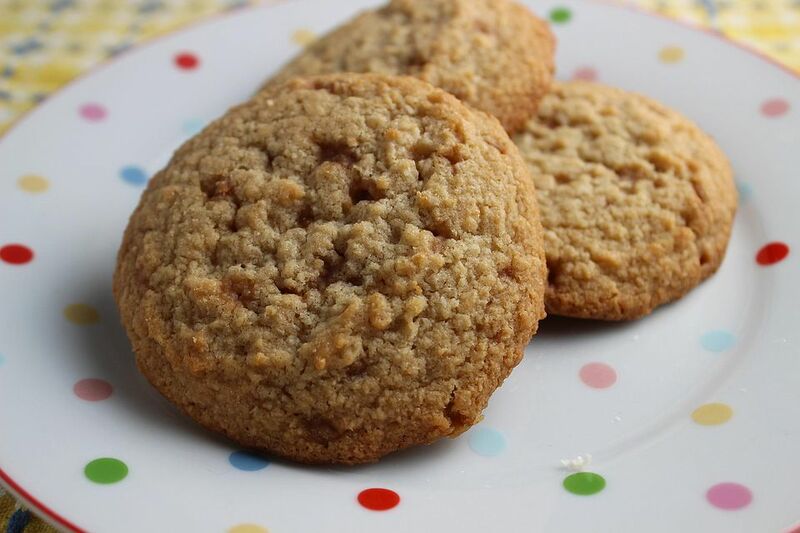 Instant oats and regular rolled oats will not give the cookies the proper texture. Store the cookies, covered, at room temperature up to four days. I like to put them into a baggie and then put the baggie into the cookie jar. If they last that long! Preheat the oven to 350°F. Get out two cookies sheets and spray them with nonstick baking spray or grease them with solid shortening. In a large bowl, combine the butter, salt, cinnamon, vanilla, corn syrup, sugar, eggs, and milk and mix with a spoon until well blended. Add the flour and baking soda to the butter mixture and blend with a spoon. Then stir in the quick cooking oatmeal and the walnuts or the coconut. At this point you can cover the dough and refrigerate it up to two days, or you can bake it right away. Drop the dough by teaspoonfuls onto the prepared cookie sheets (or use Silpat liners), about 2" apart. Bake the cookies for 10 to 14 minutes or until they are light golden brown. Let the cookies cool on the cookie sheets for 2 minutes, then carefully remove with a spatula to wire racks to cool completely.